Name Variation Meril Bain was also known as Merl. Meril Bain was born in July 1889 at Kentucky. He was the son of William Alexander Bain and Martha Hayden. [S245] U.S. Federal Census 1900 U.S. Federal Census, by Ancestry.com, Year: 1900; Census Place: Prestonville, Carroll, Kentucky; Roll: 513; Page: 6A; Enumeration District: 0040; FHL microfilm: 1240513. [S244] U.S. Federal Census 1910 U.S. Federal Census, by Ancestry.com, Year: 1910; Census Place: Indianapolis Ward 4, Marion, Indiana; Roll: T624_367; Page: 7A; Enumeration District: 0088; FHL microfilm: 1374380. Leota Bain was born in November 1893 at Kentucky. She was the daughter of William Alexander Bain and Martha Hayden. Lillie Bain was born circa 1870 at Kentucky. [S246] U.S. Federal Census 1880 U.S. Federal Census, by Ancestry.com, Year: 1880; Census Place: Prestonville, Carroll, Kentucky; Roll: 408; Family History Film: 1254408; Page: 454D; Enumeration District: 035; Image: 0189. Sophronia Bain was born circa 1872 at Kentucky. Married Name circa 1904 As of circa 1904,her married name was Bain. Littie (?) was born circa 1881 at Kentucky. She married James W. Bain, son of William Alexander Bain and Martha Hayden, circa 1904. Littie (?) had 2 with 2 living in 1910 children. [S250] U.S. Federal Census 1930 U.S. Federal Census, by Ancestry.com, Year: 1930; Census Place: Indianapolis, Marion, Indiana; Roll: 609; Page: 25A; Enumeration District: 0061; Image: 355.0; FHL microfilm: 2340344. Name Variation Charles R. Bain was also known as Charlie. Charles R. Bain was born circa 1905 at Indiana. He was the son of James W. Bain and Littie (?). Charles R. Bain married Gladys (?) circa 1924. Russel Bain was born circa 1907 at Indiana. Married Name circa 1924 As of circa 1924,her married name was Bain. Gladys (?) was born circa 1906 at Indiana. She married Charles R. Bain, son of James W. Bain and Littie (? ), circa 1924. Victor Grunewald married Herta E. Barfknecht. Victor Grunewald was born on 14 December 1896. He died on 22 December 1987 at age 91. Married Name Her married name was Grunewald. 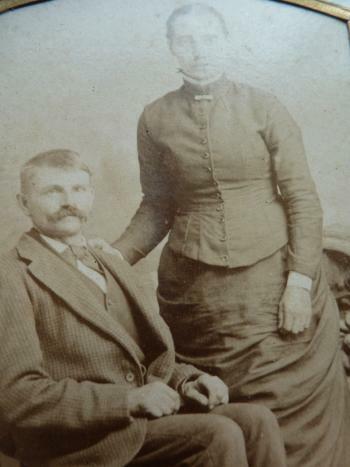 Herta E. Barfknecht married Victor Grunewald. Herta E. Barfknecht was born on 23 May 1901. She died in January 1980 at age 78. Judith Rae Friede was born in 1947 at Wisconsin. She was the daughter of August Friede and Edna M. Rasmussen. Judith Rae Friede died on 4 December 1967 at Monona, Dane, Wisconsin, Judith Rae Friede obituary. She was buried after 4 December 1967 at Roselawn Memorial Park, Monona, Dane, Wisconsin. Leonard Rupp was born on 21 March 1907 at Potosi, Grant, Wisconsin. He was the son of Peter John Rupp Sr. and Josephine Mary Stelpflug. Leonard Rupp died before 1935. Peter Langkamp was born on 7 December 1906 at Grant, Wisconsin. He was the son of Peter J. Langkamp and Elizabeth Rupp. Married Name circa 1915 As of circa 1915,her married name was Heinen. Josephine M. Bauer was born on 7 December 1893 at Rock, Cherokee, Iowa, also reported as Dec 1894. She was the daughter of Frederick Mathias Bauer and Anna E. Rupp. Josephine M. Bauer married Theodore Frank Heinen circa 1915. 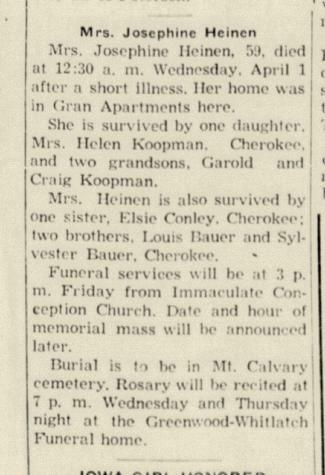 Josephine M. Bauer died on 1 April 1953 at Cherokee, Cherokee, Iowa, at age 59 Josephine (Bauer) Heinen. 1 January 1925 Cherokee Ward 1, Cherokee, Iowa Josephine M. Bauer appeared on the census of 1 January 1925 in the household of Frederick Mathias Bauer at Cherokee Ward 1, Cherokee, Iowa. [S245] U.S. Federal Census 1900 U.S. Federal Census, by Ancestry.com, Year: 1900; Census Place: Rock, Cherokee, Iowa; Roll: 423; Page: 9A; Enumeration District: 0021; FHL microfilm: 1240423. [S244] U.S. Federal Census 1910 U.S. Federal Census, by Ancestry.com, Year: 1910; Census Place: Sheridan, Cherokee, Iowa; Roll: T624_396; Page: 9A; Enumeration District: 0025; FHL microfilm: 1374409. [S243] U.S. Federal Census 1920 U.S. Federal Census, by Ancestry.com, Year: 1920; Census Place: Sheridan, Cherokee, Iowa; Roll: T625_481; Page: 6A; Enumeration District: 29; Image: 1162. [S250] U.S. Federal Census 1930 U.S. Federal Census, by Ancestry.com, Year: 1930; Census Place: Cherokee, Cherokee, Iowa; Roll: 647; Page: 12A; Enumeration District: 0005; Image: 239.0; FHL microfilm: 2340382. Sylvester Anton Bauer was born on 26 January 1898 at Rock, Cherokee, Iowa. He was the son of Frederick Mathias Bauer and Anna E. Rupp. Sylvester Anton Bauer married Frances C. Staver, daughter of Chris Staver and Evelyn Bohlen, on 8 June 1921. 1 January 1925 Sheridan, Cherokee, Iowa Sylvester Anton Bauer appeared on the census of 1 January 1925 at Sheridan, Cherokee, Iowa. Name Variation Louis John Bauer was also known as Lewis. Louis John Bauer was born on 11 June 1900 at Rock, Cherokee, Iowa. Louis John Bauer married Elizabeth Glassmaker on 28 June 1927. Louis John Bauer died on 4 September 1972 at Olmsted, Minnesota, at age 72. 1 January 1925 Sheridan, Cherokee, Iowa Louis John Bauer appeared on the census of 1 January 1925 in the household of Sylvester Anton Bauer at Sheridan, Cherokee, Iowa. Married Name before 1953 As of before 1953,her married name was Conley. Elsie Martha Bauer was born on 7 January 1909 at Sheridan, Cherokee, Iowa. Elsie Martha Bauer married Lloyd Pressly Conley before 1953. Elsie Martha Bauer died on 26 July 1974 at age 65. 1 January 1925 Cherokee Ward 1, Cherokee, Iowa Elsie Martha Bauer appeared on the census of 1 January 1925 in the household of Frederick Mathias Bauer at Cherokee Ward 1, Cherokee, Iowa. Oskar Heller was born on 6 December 1901 at Rock, Cherokee, Iowa. He was the son of Henry Heller and Sophia Glasmacher. Albert Heller was born on 1 May 1903 at Rock, Cherokee, Iowa. Florence Magdalene Heller was born on 19 December 1906 at Rock, Cherokee, Iowa. Louis Heller was born on 24 April 1908 at Rock, Cherokee, Iowa. Married Name circa 1906 As of circa 1906,her married name was Heller. Anna Christena Wester was born on 4 February 1881 at Iowa. She was the daughter of Frank Wester. Anna Christena Wester married Jacob Heller Jr., son of Jacob Heller and Mary Rupp, circa 1906. Anna Christena Wester died on 15 January 1971 at age 89. 1 January 1925 Cherokee, Iowa Anna Christena Wester appeared on the census of 1 January 1925 in the household of Jacob Heller Jr. at Cherokee, Iowa. Anna Christena Wester had 2 with 2 living in 1900 children. Children of Anna Christena Wester and Jacob Heller Jr.
[S244] U.S. Federal Census 1910 U.S. Federal Census, by Ancestry.com, Year: 1910; Census Place: Pilot, Cherokee, Iowa; Roll: T624_396; Page: 1B; Enumeration District: 0023; FHL microfilm: 1374409. Richard J. Heller was born on 21 June 1906 at Iowa. He was the son of Jacob Heller Jr. and Anna Christena Wester. Richard J. Heller died on 14 December 1995 at Los Angeles, California, at age 89. 1 January 1925 Cherokee, Iowa Richard J. Heller appeared on the census of 1 January 1925 in the household of Jacob Heller Jr. at Cherokee, Iowa. Freeman Frances Heller was born on 21 August 1908 at Cherokee, Cherokee, Iowa. 1 January 1925 Cherokee, Iowa Freeman Frances Heller appeared on the census of 1 January 1925 in the household of Jacob Heller Jr. at Cherokee, Iowa. Name Variation Thomas Anthony McKee was also known as Tom Anthony. Thomas Anthony McKee was born on 27 March 1930 at Iowa, Wisconsin. He was the son of Harvey Leroy McKee and Mabel C. Pluemer. Thomas Anthony McKee died on 7 May 1974 at Rockton, Winnebago, Illinois, at age 44. Louis F. McKee married unknown (?). Louis F. McKee was born circa 1857 at Wisconsin. Married Name Her married name was McKee. Unknown (?) married Louis F. McKee. Unknown (?) died before 1930. William Daugherty was born after 1916. He was the son of Cornelius Vincent Daugherty and Teresa Mary Kueter. Name Variation Theodore Meoska was also known as Mioski. Name Variation Theodore Meoska was also known as Mioske. Name Variation Theodore Meoska was also known as Meoski. Name Variation Theodore Meoska was also known as Meosky. Theodore Meoska was born on 26 September 1846 at Germany also reported as Sept 1847. He married Katherine Rupp, daughter of John Peter Rupp and Maria Fecht, on 8 February 1881 at Potosi, Grant, Wisconsin, also reported as 08 Feb 1880. 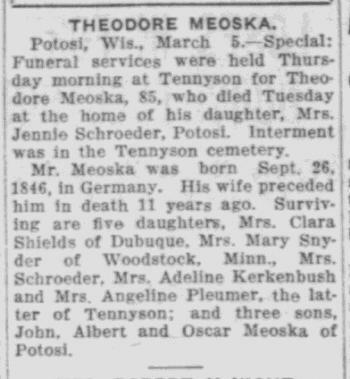 Theodore Meoska died in March 1931 at at the home of his daughter Mrs. Jennie Schroeder, Potosi, Grant, Wisconsin, at age 84 Theodore Meoska obituary. He was buried in March 1931 at St. Andrews Catholic Cemetery, Potosi, Grant, Wisconsin. Theodore and Catherine Rupp Meoska. 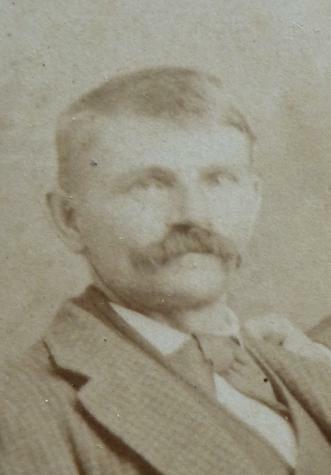 Theodore Meoska immigrated in 1871. 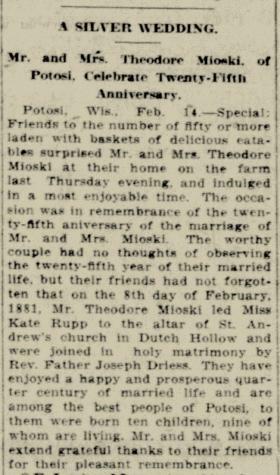 On 8 February 1906 Theodore and Katherine (Rupp) Meoska (Mioski) 25th wedding anniversary celebration. Albert Charles Meoska was born on 22 February 1888 at Wisconsin. Albert Charles Meoska married Leona Mary Frances Ulbrich, daughter of (?) Ulbrich and Hannah (? ), on 19 September 1922. Albert Charles Meoska died on 7 February 1938 at Grant, Wisconsin, at age 49. On 5 June 1917 at World War I Draft Registration, Grant, Wisconsin.